Wow. 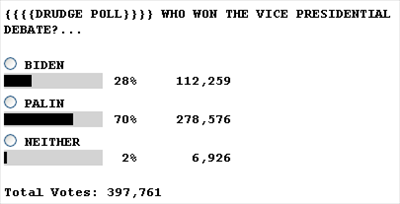 Even readers of Fox News agree that Biden won the debate. And it turns out that folks who worked with Bush and also on the McCain campaign seem to agree. And CNN's clever response indicator shows that many people didn't take the bait. Biden repeatedly won high accolades on a wide range of topics. His remarks about the personal trials of having a wife and daughter die in a car accident sent responses from both male and females through the roof. 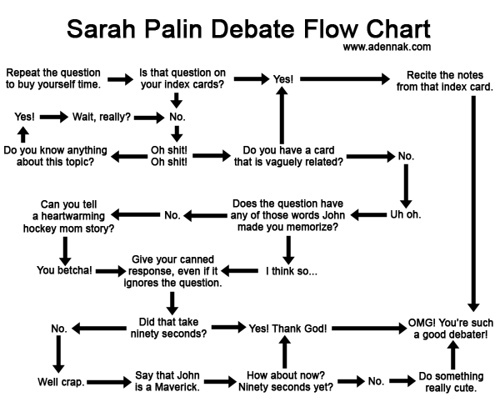 Much of the time, dial responses sunk when Palin began speaking. Respondents were generally unenthusiastic when she defended McCain. Her defense of the surge generated what was, at best, a flat response. Following the debate, only one member of the focus group said they had decided to support the McCain-Palin ticket based on the debate; a half-dozen or more said they would now back Obama and Biden. They don't seem to get how this whole thing works. Josh, you link to an article written by a Huffington Post regular... Come on. Hey Dylan - nice to hear from you. 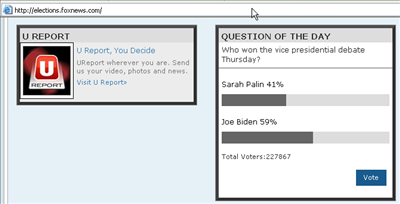 Are you suggesting that Palin won the VP debate? Oh, no. Not at all; It's not really a debate when you don't answer the questions. I just have a difficult time seeing objectivity in anything huffington post or daily kos... Know what I mean?